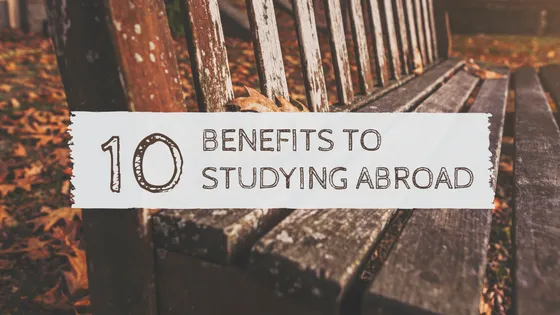 Studying abroad may be one of the most beneficial experiences for a student. By studying abroad, students can study in a foreign nation and take in the allure and culture of a new land. Here is a list of the top 10 reasons to study abroad! The biggest reason you should consider a study abroad program is the opportunity to see the world. By studying abroad, you will experience a brand-new country with incredible new outlooks, customs and activities. The benefits of studying abroad include the opportunity to see new terrains, natural wonders, museums and landmarks of your host nation. You’ll find that completely immersing yourself in the education system of your host country is a great way to really experience and understand the people, its traditions, and its culture. Education is the centerpiece of any study abroad trip—it is, after all, a study abroad program—and choosing the right school is a very important factor. Many students who choose to study abroad are leaving their home for the first time. When they arrive in their new host country, they are fascinated by the distinct cultural perspectives. When you study abroad you will find incredible new foods, customs, traditions, and social atmospheres. You will find that you have a better understanding and appreciation for the nation’s people and history. You will have the opportunity to witness a completely new way of life. When you finish your study abroad program and return home, you will return with a new perspective on culture, language skills, a great education, and a willingness to learn. Needless to say, these are very attractive to future employers. Many students find that they love their host country so much that they decide to seek work there. If you can relate, you will find that a local education will be very valuable when searching for a potential job in that country. If you are still questioning why to study abroad, you should know that studying in a different country offers many new activities and interests that you may never have discovered if you’d stayed at home. You might find that you have an as-yet undiscovered talent for hiking, water sports, snow skiing, golf, or various other new sports you may never have tried back home. You’ll also have the chance to discover other new and exciting forms of entertainment. Plays, movies, dancing, nightclubs, and concerts are just a few activities that you can enjoy. One of the biggest benefits of studying abroad is the opportunity to meet new lifelong friends from different backgrounds. While studying abroad, you will attend school and live with students from your host country. This gives you the opportunity to really get to know and create lasting relationships with your fellow students. After the study abroad program ends, try stay in contact with your international friends. In addition to rewarding personal relationships, these friends can also be important networking tools later down the road. There is nothing quite like being on your own in a foreign country. You might find that studying abroad really brings out your independent nature. Students who study abroad become explorers of their new nation and really discover the curiosity and excitement that they harbor. A benefit to studying abroad is the opportunity to discover yourself while gaining an understanding of a different culture. Being in a new place by yourself can be overwhelming at times, and it tests your ability to adapt to diverse situations while being able to problem solve. Like future employers, graduate school admissions boards look very highly on study abroad experiences. Students that study abroad display diversity and show that they aren’t afraid to seek out new challenges or put themselves in difficult situations. Most importantly, students who have studied abroad show just how committed they are to their education. Graduate schools regularly look for candidates who will bring a unique aspect to their university. Students who have studied abroad have shown that they have the curiosity and educational acumen to be a leader in graduate school. Why study abroad? For most students, this time may be the only opportunity they ever get to travel abroad for a long period of time. Eventually you will find a job and career, and the opportunity to study abroad may turn out to be a once in a life time opportunity. Take this opportunity to travel the world with no commitments but to study and learn about new cultures. Studying abroad is an experience unlike any other.